WoonderShop is a fresh and responsive WordPress e-commerce theme from ProteusThemes developer club. This theme has been specially designed to use as mobile-first e-commerce mobile theme with online store website similar to Amazon store and other popular online e-commerce portal websites. Since WoonderShop WordPress Theme has been created to use for e-commerce web portal, you will have all amazing features to create a wonderful shopping website with A to Z features. 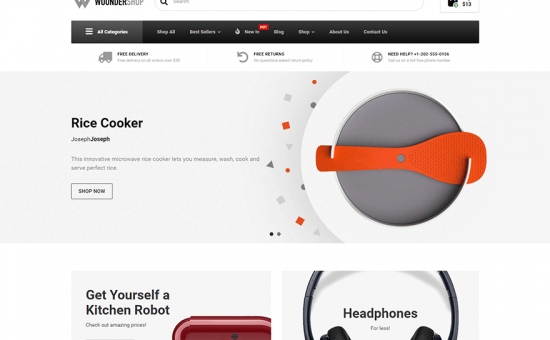 WoonderShop WordPress Theme has built a powerful e-commerce plugin called “WooCommerce”. It allows you to create and setup completes online store with ease of use and you don’t even to know the coding and advanced knowledge to set up your e-commerce. Since it will guide you to setup from a to z step for your products or items that you planned to sell it online! The beauty of WoonderShop theme is, you can set up the online store in a minute by using “One click demo import” option which will be available from the backend admin panel. Or you can also set up from some premade layouts available from ProteusThemes club. The woondershop theme is completely unique and adaptive style design to use for any kind of online e-commerce businesses. The design is full and fully drag and drop with Visual Composer page builder plugin, which is allowing you to build your own custom page as per your products without any coding knowledge. There are 40+ shortcodes elements and custom widget section to use directly on the pages or CPT (Custom Post Type) sections. Even it can be used to build your WooCommerce product page with complete integration from ordering to delivering the product to the customers. Every widget and content block can be easily progressed around to create the perfect look of your e-commerce website. This theme is also coming with LIVE EDITOR, which will help you to change everything lively from front-end, such as a live preview when adding, editing, moving, and resizing content. It makes your way of building a website even faster and advanced level. The most of important part of an e-commerce website is keeping the customers in the queue and without any distraction from your website. 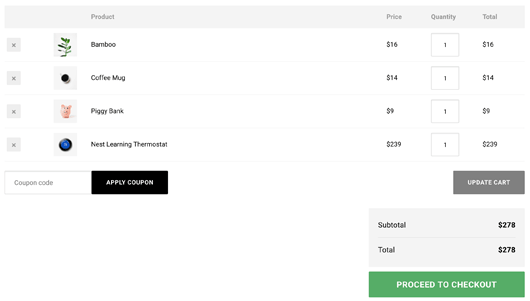 In that keep in mind, WoonderShop WordPress theme had built with distraction-free shopping cart and checkout page, which will come with a clean interface and CTA buttons that stand out will greatly reduce friction and make shoppers continue down the sales funnel. Dedicated e-mail box for signup form and integrate with MailChimp and etc. Product ratings, reviews, sorting and etc. Website Loads in Seconds tested on (Google page speed test, GTmatrix, YSlow & Pingdom) 96/100 on desktop & 97/100 on mobile devices. Theme installation documentation and complete guide!